Eugene Commins was one of the most influential atomic physicists of the latter half of the 20th century, not just through his experimental results, which were first-rate (including being one of the first to observe atomic parity violation), but most especially through his legacy of mentorship and teaching. His group at UC Berkeley produced a long list of graduates who went on to become leaders in atomic physics to this day, the most famous being Steve Chu, Nobel Laureate and former Secretary of Energy. Commins’ memorial page is full of heartfelt tributes from his former students and colleagues – a testament to his uncanny ability to inspire and bring the best out of people. Truly a model we can all look up to. When I visited Berkeley as a prospective graduate student back in spring 2015, I was interested in meeting, or at least getting a glimpse of Gene Commins. Larry Hunter (also a former Commins student) informed me that like myself, he was also an avid musician. Unfortunately, at that point he only was at his Berkeley office irregularly, I missed him by only a few hours. A few months later he would pass away. Alas! Even though I didn’t get the chance to meet the great man himself, I can take solace in working on the same type of experiment that he did in the final phase of his research career – an electron EDM beam experiment. It’s that experiment that we will examine today. In our previous post, I highlighted how Larry Hunter resurrected the electron EDM from decades of experimental inactivity. Unfortunately for Amherst College (and fortunately for the cause of science), Commins’ thallium experiment at Berkeley eclipsed Hunter’s limit on the electron EDM by a factor of 7. Unlike the Amherst experiment, which was done with cesium in a glass cell, the Berkeley experiment went back to an old school atomic beam, but using thallium. Why is thallium (Tl) much better than cesium (Cs)? Because, as I mentioned in our first post in the series, that the effect of an electron EDM in some atoms is larger than others, as expressed by the formula . It happens to be the case that . Thus it is easier to measure the electron EDM using thallium. 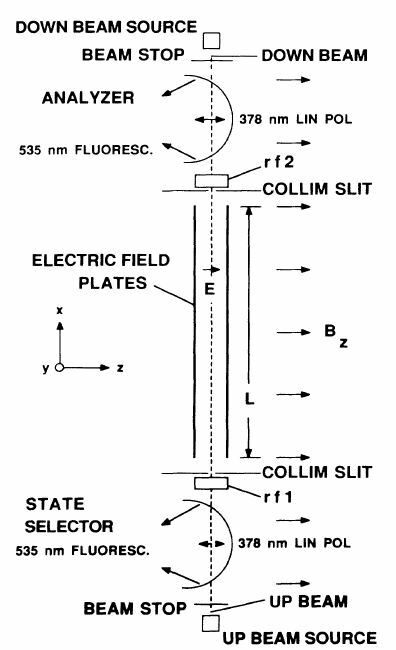 A diagram illustrating the 1990 UC Berkeley thallium atomic beam experiment, taken from their 1990 paper. The apparatus is pretty straightforward: the Tl atoms are produced from an oven, followed by a “state selector” section, where an initial quantum state of the thallium atoms is prepared, a long section where electric fields are applied to let the electron EDM work its magic on the state, and an “analyzer” section where the final state is probed. 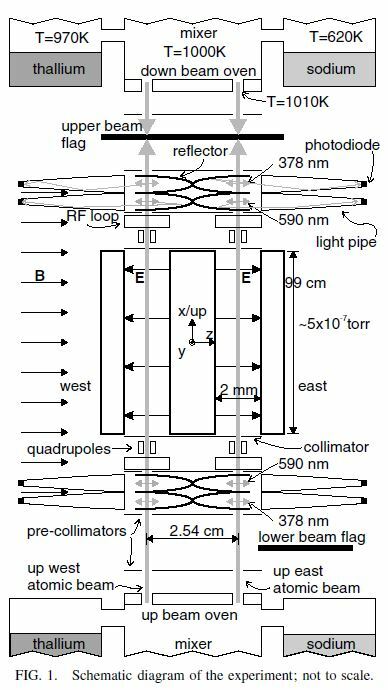 What’s interesting is that there are two beam sources (down and up). Effectively, the experiment can be run with the atoms going downwards or upwards (where the locations of the analyzer and state selector sections would be interchanged). where is the velocity of the atoms. This magnetic field adds onto the magnetic field that is already applied for the experiment. It turns out that if is not exactly parallel to , then the motional magnetic field will result in an effect that masquerades as an electron EDM – a bad, bad systematic error. It’s really hard to make perfectly aligned with . One way to take this effect out is to run the same experiment twice, with and , and see if there is any difference in the result. A true electron EDM would not reverse with , but an effect from a motional magnetic field would. Despite the excellent cancellation provided by their counterpropagating beams, the dominant systematic effect remained the motional magnetic fields discussed earlier. Diagram of the second generation 2002 Berkeley experiment (taken from their result paper in Physical Review Letters). This limit would stand for the next decade, and would prove to be the last atomic beam electron EDM experiment to get a result up to today. where in the last line we have divided by the Planck constant to convert to frequency units. So Commins in 1990 was measuring energy shifts of ~100 microhertz. Compare this to the 2014 ACME result, which despite being about 20 times better in the final electron EDM limit, was “only” measuring energy shifts of about 1 millihertz. In other words, Commins’ experiment was already ten times better at measuring frequencies than what people would achieve 30 years later. The only advantage of ACME was that it used molecules, which are much more sensitive to the electron EDM, letting them get by with a less precise measurement to still get a much better measurement of the electron EDM. And that will be the topic of our next post.